IDOMENI, Greece — While sunshine and mountains fill many of Mahmoud Ismail’s paintings, sometimes bombs and warplanes crowd the canvases. "We remember what it was like in Syria," said the 14-year-old from Damascus as he sits on a cold tile floor in northern Greece. The family fled their war-torn country four years ago because they were afraid Ismail’s two older brothers would be forced to fight for the government of President Bashar al-Assad. Ismail is part of an art therapy class at Nea Kavala refugee camp. The program aims to help them cope with what they and their families ran away from. But it is also dealing with the reality of their present-day lives. Aid worker Kayra Martinez from Durango, Colorado, said the stress of waiting to hear whether asylum applications will be approved is a constant burden. Every day, Martinez brings a dozen kids to her rented home a few miles away from the camp and turns her living room into an art studio. Friends helped her set up a NeedsList page to fund paint, brushes and canvases. To support the Greek economy, she buys the supplies locally, but has set up a Facebook page to attract attention globally. Of the 870 people at the Nea Kavala refugee camp, 40 percent are women and another 40 percent are children, according to aid groups. They are among the some 62,600 refugees — mostly from Syria and Iraq — in Greece today. In many cases, families are separated from fathers and older brothers, who fled to Europe first to look for work. Noor Swied, 17, and her brother Yousef, 14, are from Aleppo and say they haven’t seen their father in two years. “There are good people in America that are willing to do what we can from thousands of miles away"
Noor paints flowers and sunsets. Yousef likes to paint the sea. Where do they want to go? “Germany,” they both said. They want to be reunited with their father. Some children cannot even hope to see long lost parents again — Ismail said his father succumbed to cancer three years ago. He is not sure where his family will end up, but there’s only one country on his wish list. “America!” he said with a wide smile. 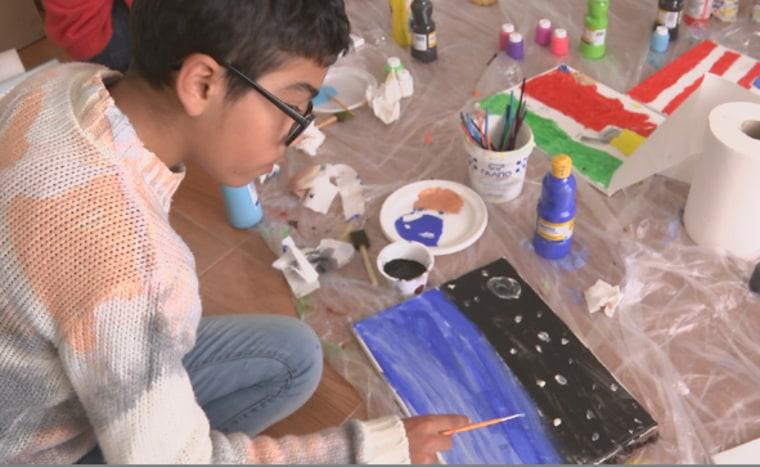 Mahmoud's art is already there — it’s part of a traveling exhibit organized by Martinez with help from friends in the U.S. All of the paintings are for sale with the money going directly to the children and their families. American Shabbi Khan bought four paintings at the first showing in Boston Feb. 13. He moved to the U.S. from Pakistan when he was 18 years old. The Timm family brought their 7-year-old son Bryce. Bryce chose their family’s purchase, a painting of a home. “Because I thought they should have shelter," he said. Kelly Cobiella is a correspondent based in London. She previously worked at CBS News and ABC News in London, following several years with CBS in New York, Dallas and Miami.